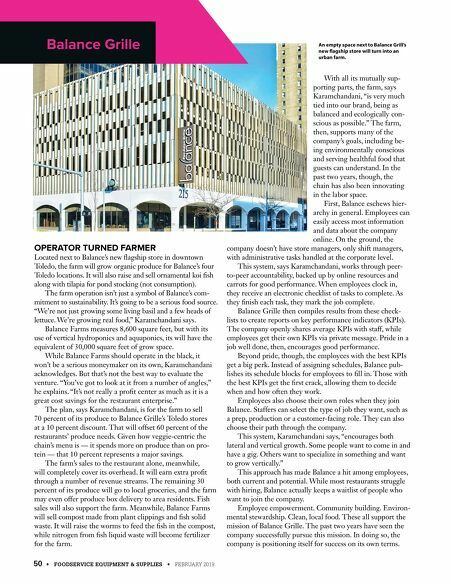 50 • FOODSERVICE EQUIPMENT & SUPPLIES • FEBRUARY 2019 OPERATOR TURNED FARMER Located next to Balance's new flagship store in downtown Toledo, the farm will grow organic produce for Balance's four Toledo locations. It will also raise and sell ornamental koi fish along with tilapia for pond stocking (not consumption). The farm operation isn't just a symbol of Balance's com- mitment to sustainability. It's going to be a serious food source. "We're not just growing some living basil and a few heads of lettuce. We're growing real food," Karamchandani says. Balance Farms measures 8,600 square feet, but with its use of vertical hydroponics and aquaponics, its will have the equivalent of 30,000 square feet of grow space. While Balance Farms should operate in the black, it won't be a serious moneymaker on its own, Karamchandani acknowledges. But that's not the best way to evaluate the venture. "You've got to look at it from a number of angles," he explains. 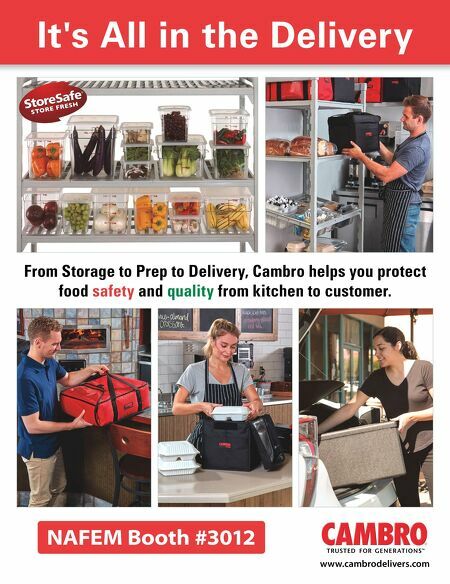 "It's not really a profit center as much as it is a great cost savings for the restaurant enterprise." The plan, says Karamchandani, is for the farm to sell 70 percent of its produce to Balance Grille's Toledo stores at a 10 percent discount. That will offset 60 percent of the restaurants' produce needs. Given how veggie-centric the chain's menu is — it spends more on produce than on pro- tein — that 10 percent represents a major savings. The farm's sales to the restaurant alone, meanwhile, will completely cover its overhead. It will earn extra profit through a number of revenue streams. The remaining 30 percent of its produce will go to local groceries, and the farm may even offer produce box delivery to area residents. Fish sales will also support the farm. Meanwhile, Balance Farms will sell compost made from plant clippings and fish solid waste. It will raise the worms to feed the fish in the compost, while nitrogen from fish liquid waste will become fertilizer for the farm. With all its mutually sup- porting parts, the farm, says Karamchandani, "is very much tied into our brand, being as balanced and ecologically con- scious as possible." The farm, then, supports many of the company's goals, including be- ing environmentally conscious and serving healthful food that guests can understand. In the past two years, though, the chain has also been innovating in the labor space. First, Balance eschews hier- archy in general. Employees can easily access most information and data about the company online. On the ground, the company doesn't have store managers, only shift managers, with administrative tasks handled at the corporate level. This system, says Karamchandani, works through peer- to-peer accountability, backed up by online resources and carrots for good performance. When employees clock in, they receive an electronic checklist of tasks to complete. As they finish each task, they mark the job complete. Balance Grille then compiles results from these check- lists to create reports on key performance indicators (KPIs). The company openly shares average KPIs with staff, while employees get their own KPIs via private message. Pride in a job well done, then, encourages good performance. Beyond pride, though, the employees with the best KPIs get a big perk. Instead of assigning schedules, Balance pub- lishes its schedule blocks for employees to fill in. Those with the best KPIs get the first crack, allowing them to decide when and how often they work. Employees also choose their own roles when they join Balance. Staffers can select the type of job they want, such as a prep, production or a customer-facing role. They can also choose their path through the company. This system, Karamchandani says, "encourages both lateral and vertical growth. Some people want to come in and have a gig. Others want to specialize in something and want to grow vertically." This approach has made Balance a hit among employees, both current and potential. While most restaurants struggle with hiring, Balance actually keeps a waitlist of people who want to join the company. Employee empowerment. Community building. Environ- mental stewardship. Clean, local food. These all support the mission of Balance Grille. The past two years have seen the company successfully pursue this mission. In doing so, the company is positioning itself for success on its own terms. Balance Grille An empty space next to Balance Grill's new flagship store will turn into an urban farm.